Play'n GO recently launched their sequel to the extremely popular Gunslinger slot with improved graphics along with a progressive jackpot with explosive winning potential. Enjoy a captivating journey to the Old West while playing the latest slot release from Play'n GO. With desolate arid graphics, the new Gunslinger: Reloaded slot offers a magnificent Western theme where players will be required to hunt down tenacious outlaws to get their hands on some lucrative bounties. The slot takes place in a classic Western town with jaw-dropping animation quality and ground-breaking sound effects to provide a truly spectacular reel-spinning adventure. The new Gunslinger: Reloaded slot from Play'n GO online casino software is propelled by 5 reels and 25 non-adjustable paylines that can be enjoyed on both desktop and mobile devices. Players will also be treated to unlimited free spins along with a 2x multiplier, an action-packed Bounty Hunt feature which allows players to take down several bad guys for massive cash prizes, as well as a Shoot the Cards feature which gives players the opportunity to trigger the progressive jackpot. The Bounty Hunter will represent the game's wild symbol and will replicate all other symbols to form a winning combination, except for the free spin scatter symbol in the game. The Bounty Hunter wild symbol is also the most rewarding symbol in the game, awarding players with up to 400 times their total bet when 5 are triggered on an active payline. The Whiskey Bottle will act as the game's scatter symbol and will only appear on reels 2, 3, and 4. Displaying 3 Whiskey Bottle free spin scatter symbols in a single spin will unlock the Bottle Spins Free Spins round. Once activated, players will need to shoot one of the three bottles to receive between 10 and 25 free spins and all winnings made during the free spin feature will be doubled thanks to a 2x multiplier. The Bottle Spins free spin feature can also be re-triggered indefinitely, giving players an unlimited dose of free spins. The game also comes equipped with Wanted Poster bonus symbols that will only be displayed on reels 1, 2, and 3. Players will need to land 3 Wanted Poster bonus symbols simultaneously to unlock the Bounty Hunt feature. Once unlocked, players will need to select their target from the bounty board and start chasing their outlaw through the old western town. Players will need to use dynamite, throw knives, and shoot bottles before an epic showdown will take place. Each outlaw will come equipped with a different bounty. For instance, Jessie Picket provides a 2x multiplier along with up to 36 times your total bet, Butch Curry provides a 3x multiplier along with up to 72 times your total bet, and Wild Bill provides a 4x multiplier along with 240 times your total bet. Lastly, players will also be treated to a Shoot the Cards bonus feature which is triggered when players can successfully collect every poker card in the game to generate a winning combination. Once all the poker cards are collected, players will have the opportunity to win the progressive jackpot. The higher the bet, the higher the chances will be to win. If all the cards feature a sheriff's star on them, the progressive jackpot is rewarded. Each of the theme-related symbols featured in the game beautifully complements the overall look and feel of the game. There are several poker chips and poker cards taking care of the lower-paying symbols in the game along with a sheriff's badge as well as a locket that features the bounty hunter's sweetheart. The bag of gold is the highest paying symbol in the game, paying up to 40 times the total bet when 5 are triggered on an active payline. The new Gunslinger: Reload slot boasts a sensational selection of betting options even though it's restricted to 25 non-adjustable paylines. Players can still choose between several coin denominations, making the minimum stake per spin a mere $0.25, while the maximum stake per spin is $100. 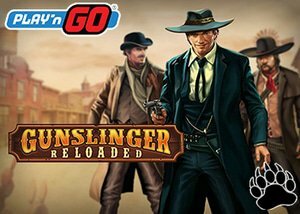 The new Gunslinger: Reloaded slot from Play'n GO impresses with a payout ratio of 96% and is available at all Play'n GO casinos from October 2018. We highly recommend that you play the new Gunslinger: Reloaded slot at Casumo Casino where you'll receive 100% welcome bonus up to $500 along with 20 free spins on Starburst on your initial deposit. Terms and Conditions apply.